This past week was Bright Week for Eastern Orthodox Christians and the sunny skies, warmer temperatures and blooming foliage added to our joyous celebration of the Resurrection. Yes, we rejoiced celebrating Easter (Pascha) this past Sunday. If you’re perplexed I recommend reading this wonderful explanation why Orthodox Easter was a month after most other Christians celebrated Easter on March 31st. So where am I going with this? 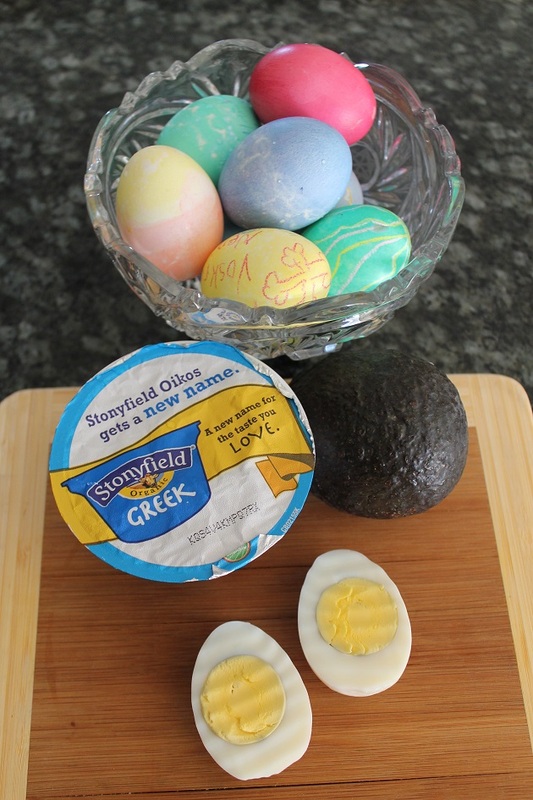 I had a bowl full of colored Easter eggs in the fridge and a taste for creamy deviled eggs. And I’m not ashamed to admit that my motive for creating my own version of avocado deviled eggs was due in part to my desire to reduce the cholesterol in these little delights and equally in part to selfishly wanting to save some calories –so I could indulge in a handful of peanut M&M’s for dessert. Hey, ya gotta live a little! 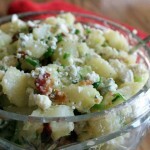 A tiny dollop of Greek yogurt adds to the velvety texture of the avocado and lends a subtle tang. A pinch of smoky Spanish paprika with a smidgen of granulated garlic provides the “Hmm factor.” You know, that brief moment after taking a bite when you can’t quite put your finger on the ingredient(s) behind that unique taste. 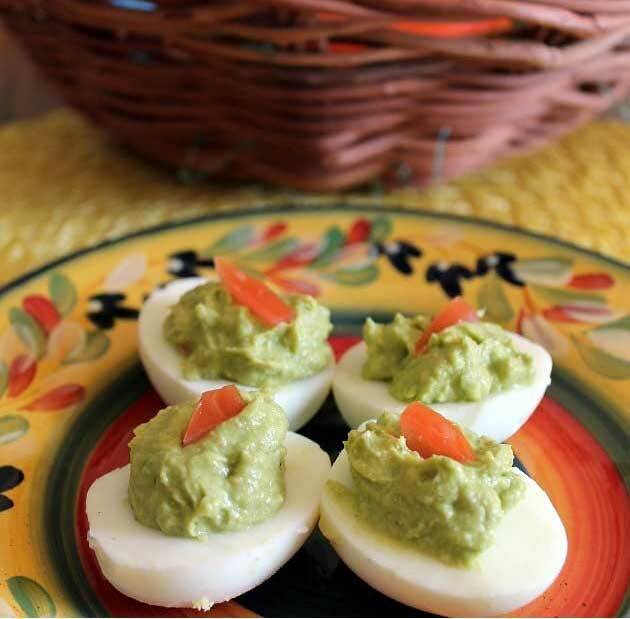 I can see these smoky avocado deviled eggs making an appearance on a few of the buffets I serve throughout the year, casual get-togethers with family and friends noshing on finger foods with a fine red wine in hand. And by fine I mean tasty, price is irrelevant to this budget wine connoisseur. Of course, my resident food critics include a 17 year old avocado snubber who politely passed on taking even the tiniest of tiny bites. My other two critics gave these smoky avocado deviled eggs two forks up, with Hubby noting that he’d prefer a bit more Spanish paprika and garlic. 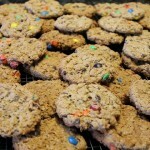 It’s all a matter of taste so go ahead and twist and turn the filling to make it your own. The dab of Greek yogurt can easily be eliminated if you don’t have any on hand or substituted with sour cream. In keeping with tradition I greet you with Christ is Risen! Indeed He is Risen! 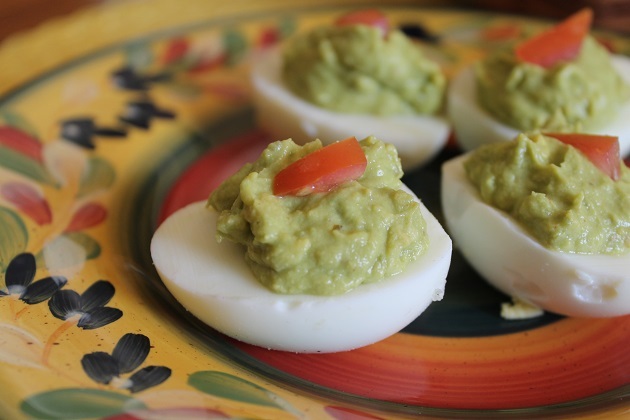 Smoky avocado deviled eggs take on a new spin with Spanish paprika, garlic and a bit of Greek yogurt. Creamy, delicious and far fewer fat grams and calories than traditional deviled eggs. Remove the yolks from the hard boiled eggs and put 4 halves (yolk of 2 whole eggs) into a medium size bowl and mash well. Add the avocado and remaining ingredient. Beat until creamy and fill each egg.